Following the sharing economy, now the gig economy, the ‘Airbnb of labor’ with platforms like Deliveroo, Helpling, and Uber, is on the rise. In the United States, the growth of the gig economy, with jobs like taxi drives, bicycle couriers, online translation services and ‘local home services’ for cleaning, babysitting, and dog walking tasks, outnumbers the growth in Europe. Platforms like Uber, Deliveroo, and Helpling lower the thresholds for consumers with smart technology, so they can buy services conveniently and cheaply. Ideal for the end user, but how about the labor providing worker? Although everyone agrees on the fact that these platforms are a strategic and technical masterpiece (as well as in their marketing effort), there also is an ever growing amount of critique. Parallel to the well-known debate about power concentration, privacy, and data, more and more questions are asked about the fact that users, who add value to the system, build up a dependency relationship with the platform, but don’t get any profit of this return. Combine this with the billions of dollars in venture capital invested in these platforms, and logically some of them go looking for alternatives. The urgency is the strongest within the gig economy. At the moment you, as laborer, are strongly dependent on a platform, the impact is the greatest. In recent years there have been discussions and experiments with an alternative decentralized model in the United States, in which the ones adding value to the platform will indeed be rewarded with the ownership and management of the platform. Trebor Scholz, ‘scholar activist’ and associate professor at New School in New York, christened this philosophy ‘platform cooperativism’. The philosophy behind this idea sounds simple an pleasant: What if the Uber drivers would be the owners and management of the platform? With the diminishing costs of technology and growing international interest of users, discussion about and experiments with cooperative platform models are taking place in several industries. Back in 2016, 800 Denver taxi drivers gathered to invest a 2.000 dollar each for the development of the Green Taxi cooperative. This is about one-third of all cab drivers in Denver linked up to this organization. Regardless of the total investment being overover a million dollar, Green Taxi hasn’t invested in their own technology. This is being bought from Autocab, a SaaS provider of central taxi systems. Besides ‘honest’ ownership and control over their own central unit, the unification in a cooperative also provides a strong united voice in debates around, for example the allotment of taxi stands at the airport. Whereas the majority of platform cooperatives invests in technology and the management of the system themselves, Up&Go from New York changes tack. Up&Go facilitates existing cleaning cooperatives in New York with an app to better help their customers. The cleaners keep the control of the contact with their customers and determine also the price, without being bothered by the (further) development and maintenance of the technology. Up&Go is a initiative of several ‘do good’ organizations; the company who built the app is a cooperative itself. However often Up&Go has been mentioned as an example, it still isn’t a cooperative itself. The developers, I communicated with, told me that the cleaning cooperatives using the app will in turn become the owners of the platform by a cooperative model over time. In the end a similar result, albeit with a different approach. The market with stock photo websites grows rapidly and suffers from a lot of dissatisfaction about the power and the margins on these kinds of websites. This inspired two photographers, previously owning a traditional stock photo website themselves, to take the leap to a new model in 2013. At Stocksy photographers who are affiliated with the platform, with a maximum of 100 at the time of writing, also became co-owner and manager of the platform via a cooperative. Stocksy tries to profile itself as an exclusive stock photo website: there is a strong selection at the door and every picture that is published is judged by an in- house committee. This is the way photographers build a high-end brand not only distinguishing itself in the market by its model, but also by quality and exclusiveness. Platforms are successful due to network effects. The more people join, the better a platform functions. The fact all of your friends are on facebook, makes it the best platform for you to join to connect with them. Breaking the network effect is generally speaking extremely difficult, as you have to convince everyone to switch to an alternative platform. Although a monopoly position in a growingly internationalizing world is the best way to optimally create added value for its users, part of the playing field of the gig economy looks differently: the gig platforms facilitating labor in physical ‘offline’ places. The taxi driver has to meet the customer in order to complete the transaction and the cleaning lady has to come to your home in order to clean it. As supply and demand are physically located close to one another, there is no leading national or international effect, but only a local network effect. This differs completely from platforms like Airbnb (sharing homes) and Upwork (online labor) where supply and demand are usually situated in different parts of the earth. The fact that in many segments of the gig economy the meeting has to take place in an offline environment determines that these segments only need a (hyper) local network effect. 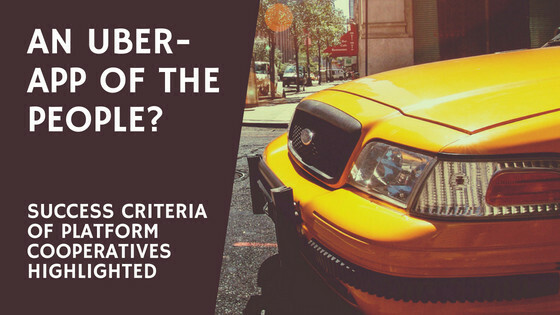 This offers opportunities for new players and existing local organizations like taxi companies and cleaning cooperatives. Green Taxi is a wonderful illustration of this point. Platforms lacking a requirement for a physical meeting between supply and demand, oftentimes even being located on different continents, it is much harder to make a decentralized initiative work. As for now, it only seems possible when the workers offer a unique and exclusive product, as is the case with Stocksy. To develop and successfully launch your platform (multisided marketplace) is an art in itself. It is questionable if a group of cleaners or drivers –the same counts for lawyers or accountants– possess the needed qualities to develop successful technology that is able to compete with the current generation of apps on the market. I doubt it and consider it a risk to have about 100 taxi platform cooperatives with 100 poorly functioning and hideous apps or mobile website. Personally, I find the Up&Go model the most interesting of them all. Existing, and in times to come maybe also occurring, labor cooperatives being empowered with a platform model, which in turn continues as a SaaS-solution. Following the saying of ‘let a cobbler stick to it’s last’, laborers should rather focus on what they’re good at and developers behind Up&Go at what they do best. An additional advantage is found in that investment can be shared among several cooperative clients, which will greatly influence the quality provided to the customers benefitting of it while using the platform. Important note on the side is that this entity should have a cooperative approach itself, or the story would start all over again. In order to realize a more democratic playing field, there are plenty of opportunities to seize for governments. Governments can lower thresholds by behaving like a platform themselves and facilitate local platform cooperatives with APIs with a link to their identity checks, a ‘certificate of good conduct’ database, and so on. On top of this, governments can use means to break data monopolies of larger players. 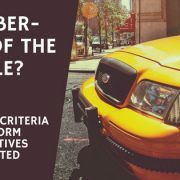 The government could, e.g., change the taxi meter by an app in which drivers have to log in and which by means of camera continuously checks if the driver behind the wheel is the one with the linked registration. In the background, data used by companies like Uber to feed their algorithms can be released publicly enabling each and everyone building a taxi app to use such. If you want to make impact as (platform) entrepreneur, you may choose by making impact with the growth of one organization, or by putting up a replicable model. As for the local impact of platform cooperatives a replicable model looks most viable. But how to offer a spoiled Uber customer who got used to use only one app in every city in the world for ordering a taxi? By cooperating. This is the reason it will be necessary to make agreements exceeding the platform itself, e.g. about data standards, reputation systems and the more. In that case a customer form city A will be able to book a taxi in city B. Hence a dozen Davids may be an alternative to a Goliath. The power of a platform falls or stands with the grace of its users. When the supply or demand group unites, it can be done in no time. Existing associations, sector organizations, or trade unions can play an important role in supporting or setting up platform cooperatives. Look for support your platform cooperative can obtain from partnering with such organizations — and also what your company can offer them in return. The fact that an enterprise is owned and managed by a local group of workers should not compromise the quality and convenience of the app, the service, or even the price levels. Before starting a platform cooperative, take a deep look and decide whether your platform cooperative would actually be able to offer an honest alternative to the larger, venture-backed platforms before starting it. Although there are many opportunities for successful platform cooperatives, of which the interests of the user are leading, it has become clear that the model is harder to realize than initially indicated. Trickier doesn’t mean impossible, and hence it encouraged me to see a diverse group intrinsically motivated professionals taking up the challenge during my visit at the ‘Platform Cooperativism’ congres in New York last November. Because real entrepreneurs and do-gooders avoid challenges. Crash and burn: this is what I learned from my failed crowdfunding campaign... The New Uber Model: Best or Most Foolish Choice Ever?